Click top link in Related Products for the replacement sign that corresponds to this item. Address Plaque with 2 Large Aluminum Numbers - - personalized house number sign. Custom made for you. Contains two large 3.75" high aluminum numbers (0.5" projection). 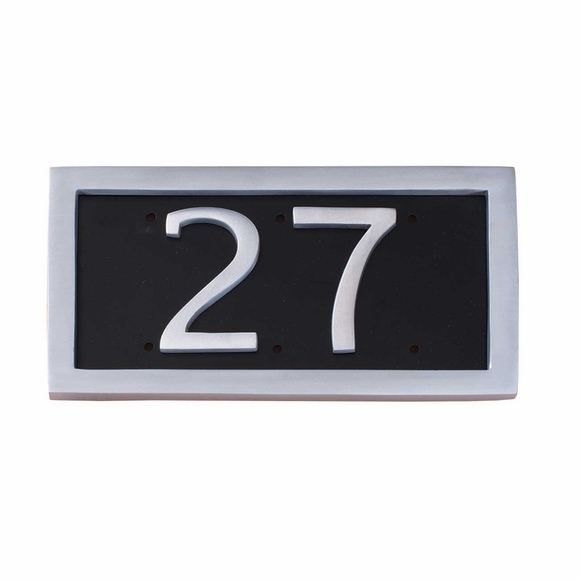 Black plaque with solid aluminum numbers and border. Elegantly classic style is both tasteful and sophisticated. Dimensions: 6" high x 10.625" wide. Also available with brass numbers and for a three-, four- , or five-digit house number (see Related Products).